Michelle first learned of Dr. Brené Brown’s work from her 2010 Tedx Houston talk, The Power of Vulnerability, one of the top ten most viewed TED talks in the world. Click here to watch this powerful presentation. From there she went on to read all of Dr. Brown’s books: I Thought It Was Just Me (but it isn’t), The Gifts of Imperfection, Daring Greatly, and Rising Strong. She came to the conclusion that she wanted to be a part of facilitating the curriculum Dr. Brown had developed. In September 2014 , Michelle travelled to San Antonio to participate in training to become a Certified Daring Way™ Facilitator. For the next year she worked with a consultant from the Daring Way™ to fine tune her skills as a facilitator. 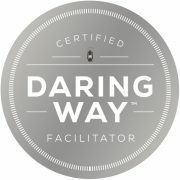 In September 2015 Michelle completed her candidacy and became a Certified Daring Way™ Facilitator. She now offers workshops and intensive weekend retreats on The Daring Way™ and Rising Strong™ curricula. The curricula explore topics such as vulnerability, courage, shame, and what it means to experience a fall only to rise up again. Michelle incorporates these concepts into both individual counseling and in workshops and retreats. The primary focus is on developing shame resilience skills and developing daily practices that transform the way we live, love, parent, and lead. The Daring Way™ is a highly experiential methodology based on the research of Dr. Brené Brown. The method was developed to help us learn how to show up, be seen, and live braver lives. By developing shame resilience skills and practicing wholehearted living we are able to transform the way we live, love, parent, and lead. Rising Strong™, is based on the simple physics of vulnerability: If we are brave enough, often enough, we will fall. This is a curriculum about what it takes to get back up and how owning our stories of struggle gives us the power to write a daring new ending. Struggle can be our greatest call to courage and the clearest path to a wholehearted life. Sign up for our Rising Strong Intensive Workshop, April 28-29, 2017: RISING STRONG. The class will also be offered on October 20-21, 2017. These groups and workshop experiences are based on the work of Dr. Brené Brown Ph.D. LMSW, a research professor at the University of Houston Graduate College of Social Work. She has spent the past fourteen years studying vulnerability, courage, worthiness, and shame and her groundbreaking research has been featured on PBS, NPR, CNN, The Katie Show, and Oprah Winfrey’s Super Soul Sunday. Brené’s work is transforming individuals, marriages, families, and the work place, and it is powerful because it is tapping into what we were all profoundly and deeply created for…. love and belonging. By participating in one of our The Daring Way™ or Rising Strong™ groups or workshops, you will have the opportunity to explore how to live bravely every day by showing up in the arenas of your life and relationships to become the best, most authentic version of you.